It’s surprising how often I get asked to look at tiled floors stained with paint and other chemicals because of careless decorating work. 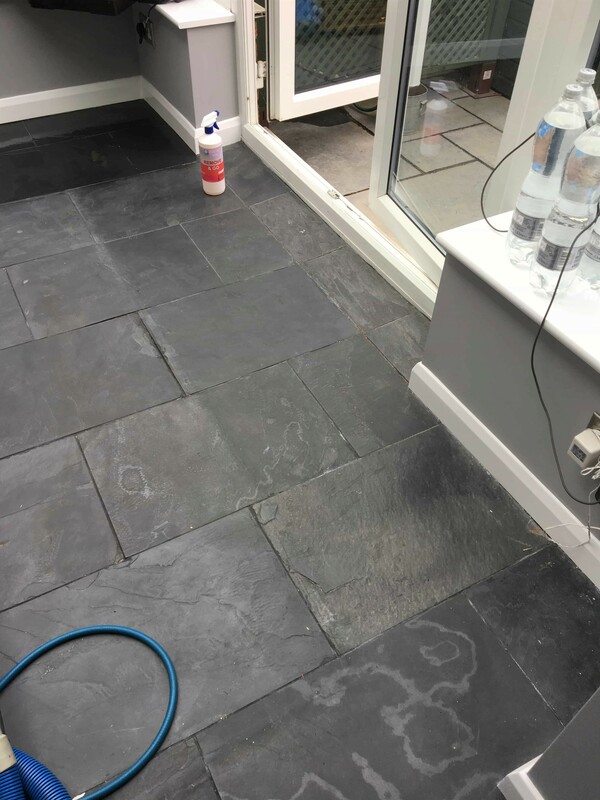 Such was he reason that I was asked to renovate this Slate tiled floor that had been installed in the garden room of a house in Hampton, in the London Borough of Richmond upon Thames. On this occasion the customers decorators had not covered the floor properly prior to painting which led to spots of paint and a white haze in places where they had tried and failed to rub the emulsion off the stone floor. 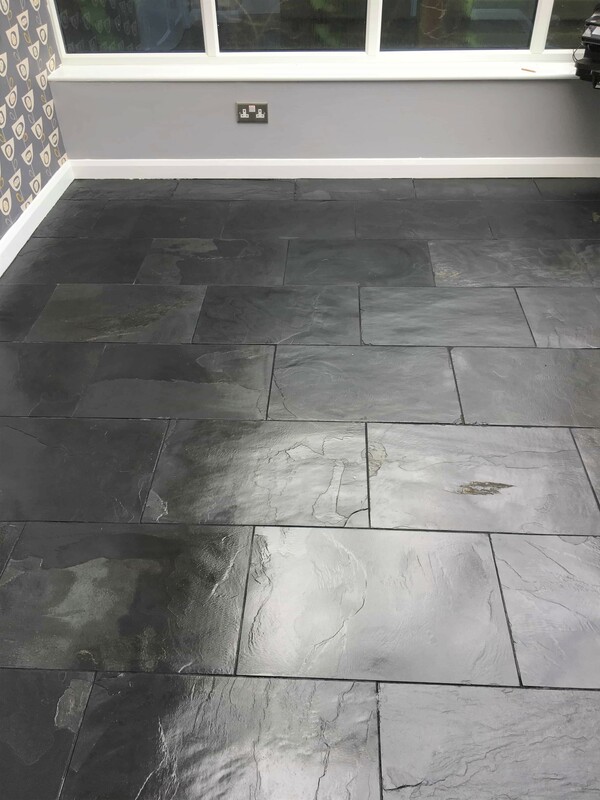 I went over to take a look and could see that the floor would benefit from been given a thorough clean, spot treating the decorating issues in the process and then given a fresh coat of sealer to protect the floor going forward and bring out the character of the stone. Having given the customer a quote which was accepted we agreed a date for me to return and given the floor a new lease of life. 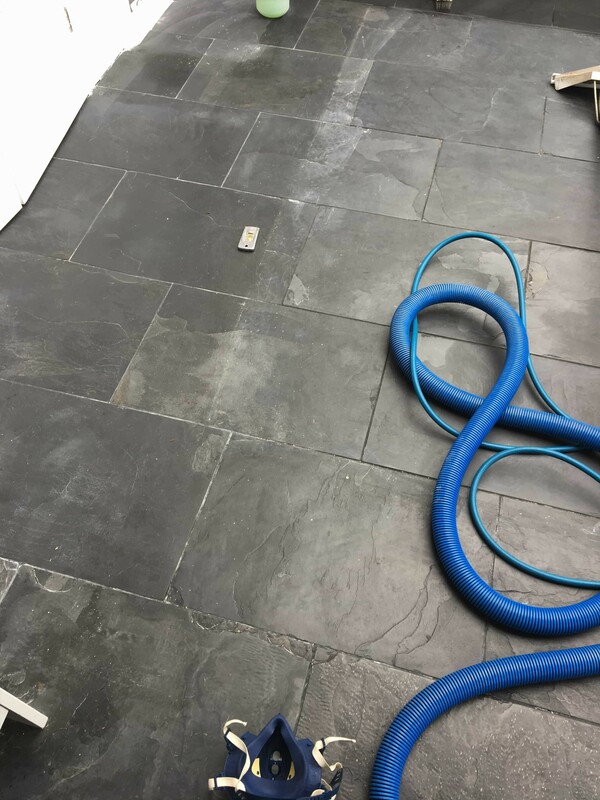 The correct way to restore a floor such as this is to first strip off any existing coatings such as old sealers and take the tile back to its original condition. To do this I sprayed on a dilution of Tile Doctor Remove and Go and left to dwell and soak into the old sealer and paint stains. Remove and Go is a stripper that as its name suggests is designed to be used on Tile, Stone and Grout. 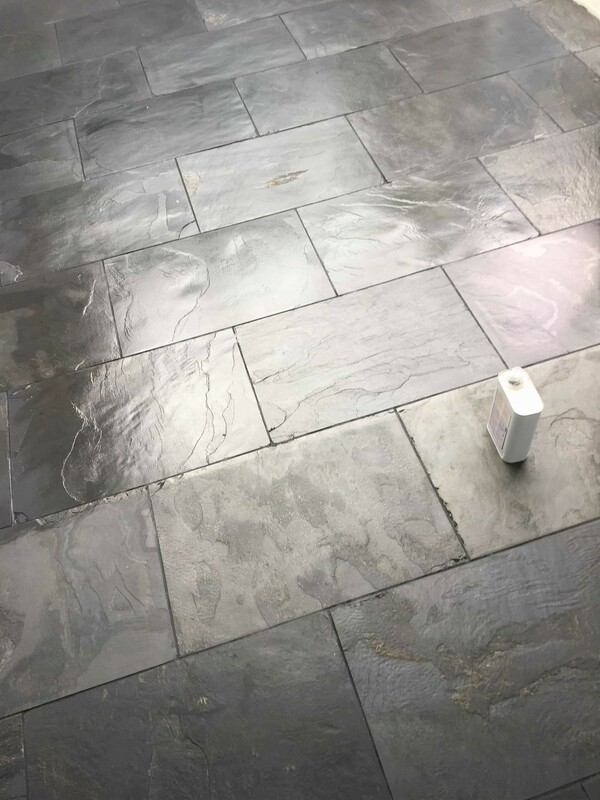 After ten minutes the product was worked into the slate tile and grout using a heavy duty rotary scrubbing machine. To help with the cleaning process, we also sprayed on Tile Doctor Pro-Clean which is our go to Tile and Grout cleaning product. The solution soon turned into a slurry as the dirt, old sealers and stains were lifted out of the pores of the slate. To remove the soil the floor was rinsed with water and then extracted from the floor using a wet vacuum. The floor was then inspected, and stubborn stains spot treated until I was happy with the condition of the tile and grout. The floor was given a final rinse to remove any trace of cleaning products and then dried as much as possible using the wet vacuum. The floor now looks completely revived and the sealer will help keep it looking that way for some time to come. Jon was very professional and courteous. He turned up on time and the tiles now look amazing. He also gave sound advise on tile care. Recommended! Jon did an excellent job of cleaning our tile. He was very prompt in providing us a quote and scheduling the work. He was very professional and we are highly satisfied with the cleaning. We would happily recommend Tile Doctor. Excellent service from start to finish. Has really rescued the tles, now they look like new! Excellent service. Sorted out my floor and was very helpful at all times. No issue was too much for Jon, he managed to get the floor sorted when I thought nothing could be done ! Jonathan was thoroughly professional, careful and courteous; it was a pleasure to have him in the house. We were delighted with the huge impact he made on the floors, which actually we didn’t think were that bad to start with. He’s left them brighter and more lustrous, bringing our old Edwardian tiled hall floor in particular back to life. I was impressed with the work that was carried and the neat job that was made of the silicone strip replaced around the bath. Jon was very professional with his work and advice. He kept in constant contact with me regarding the work and progress. I am delighted with the result!